The fair is in full swing now. I spent the better part of two days baking and overseeing the kids baking for just one contest. The first big contest was both a success and a failure all in one. The contest was for teacakes. Before baking, I asked what they meant by tea cakes. I quick google search revealed that the term teacake is pretty broad and varies by region. But, the basic definition of a teacake is a small sweet bun with dried fruit that is toasted or buttered. Then again, there are also Russian Tea cakes which are dry cookies covered in sugars , Japanese Tea cakes which vary from cookies to actual cakes but aren't very sweet, Southern Tea cakes which are essentially glorified sugar cookies, Victorian tea cakes are spongecakes, or if you ask Martha Stewart tea cakes are pretty much petit fors. Heck, even Urban Dictionary has a definition: basically any small cake or cookie eaten with afternoon tea. When I asked the person in charge what type of tea cakes they were looking for, she said that it was pretty much anything. I thought I was good to go with my amazing Cornmeal Blackberry tea cake. It's amazingly soft, slightly sweet with a fresh blackberry in the center. It's one bite of mini cake heaven. After the judging and my subsequent loss, I asked them what went wrong because my little cake was delicious. The judges thought so, too. But, they said I hadn't made a traditional tea cake. They judges read the same rules as the contestants and interpret them on their own. These judges were looking for the very best southern tea cake. Yup. They wanted the very best sugar cookie ever. I wasn't the only one who brought in something other than a sugar cookie. We all lost together. The somewhat ironic part of it: I entered in a fancy sugar cookie in another contest. One that was called: Cookies. I'll share that recipe later this week. 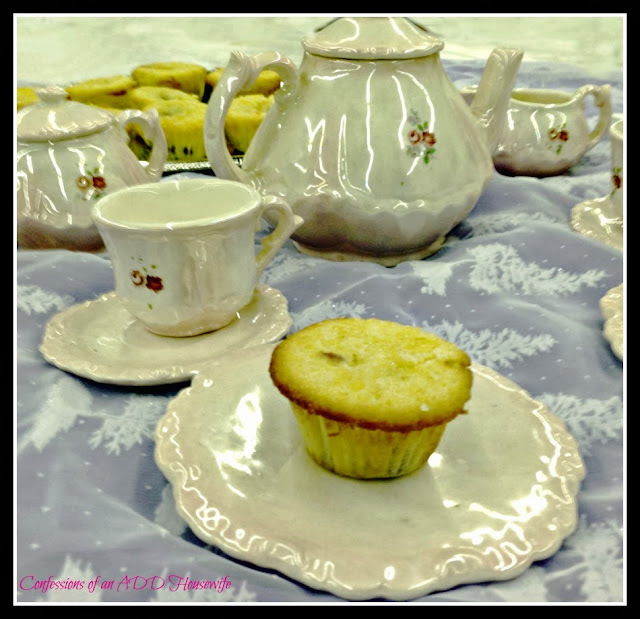 Instead, today you get my amazing Cornmeal Blackberry Tea Cake recipe. Preheat oven to 375 F. Make sure it's at 375. Any lower and the blackberries will sink! In a small bowl whisk together flour, cornmeal, baking powder, salt, and 1 cup plus 2 tbsp sugar. Set aside remaining sugar. In a large bowl, whisk together buttermilk, eggs, and melted butter. Pour over flour mixture, whisking to combine. Fill each cup with a scant about 1 T batter. Place one blackberry in each muffin cup, then sprinkle evenly with the remaining 2 tbsp sugar. Bake until evenly browned on top, 20-25 minutes.